Also, as I posted earlier, he wanted to take Moscow in 1945 and free the rest of Europe. That’s why they assassinated him. “I understand the situation. Their (the Soviet) supply system is inadequate to maintain them in a serious action such as I could put to them. They have chickens in the coop and cattle on the hoof — that’s their supply system. They could probably maintain themselves in the type of fighting I could give them for five days. After that it would make no difference how many million men they have, and if you wanted Moscow I could give it to you. They lived on the land coming down. There is insufficient left for them to maintain themselves going back. Let’s not give them time to build up their supplies. If we do, then . 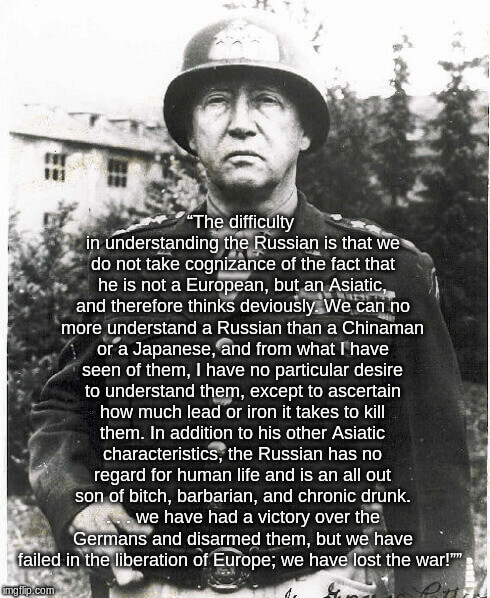 . . we have had a victory over the Germans and disarmed them, but we have failed in the liberation of Europe; we have lost the war!” — Patton. Prior to his assassination by the Soviets.